We see here all phases of the aspect's life (it begins-culminates-ends). How can this be done with Timing Solution? Before doing anything, we need to understand clearly what kind of statistical criteria should be applied in this particular case. Definitely, it is not Pearson correlation criterion. Correlation criteria are applied when we compare two time series data sets - like the correlation between historical volatility data set and tidal force data. However for financial market data it is better to apply another criteria. I believe the best is the usage of chi square statistical criterion. While working with this criterion, we need to cover many small though very important things. Sample size. The first question you should ask is: "What is the sample size is?" or "How often does this aspect take place?". Your sample size should be big enough to get significant statistical results. 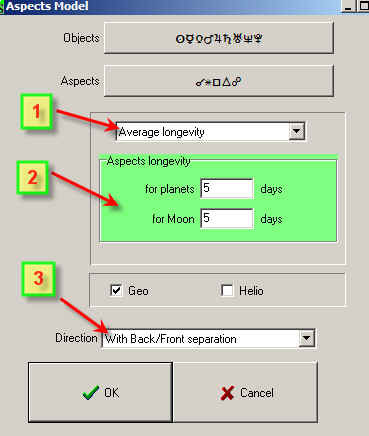 For example, somebody says that he has found the aspect that forecasts the next week's direction with the accuracy 75%. Ask him this question: how often does this aspect take place? If the answer is "4 times", simply recommend this person to flip the coin 4 times and see what happens. We do not need complicated statistical books in this case, just use your common sense, nothing else. 4 times is not enough for any conclusion. I guess Raymond Merriman did his research using Dow data, which is more than 100 years of price history. There are slow aspects in his Table; as an example, take Jupiter - Saturn. Its period is almost 20 years. I tend not considering Jupiter aspects, the random mistake is too high here. 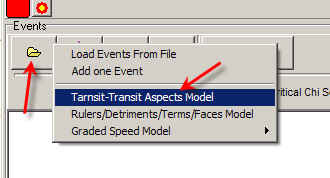 Faster aspects are OK in this regard. The average distance between reversals is almost 40 days. 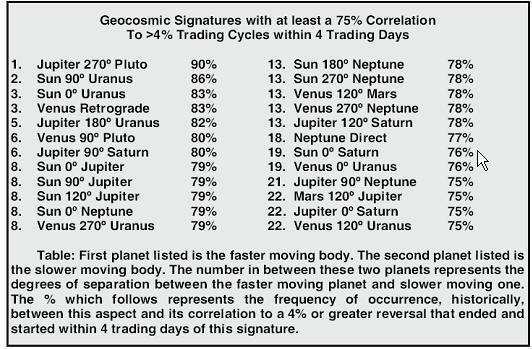 Raymond Merriman says about the time span "within 4 days of this signature"; in other words, it covers 8 days interval (4 days before and after) while 4% reversal happens at least once in any 40 days. So, the signature he mentions deserves your attention, it is OK, and you can continue this research. But- if somebody says about "within 20 days of this signature", the time span in consideration is 40 days. The reversals still take place within 40 days; it means that the reversals happen no matter what signature with 40 days time span is analyzed. In statistics, it is called "the artifact". However, in our case everything is OK.
3) separate Back and Front aspects (like Jupiter-270-Pluto and Jupiter square Pluto). You can decrease the sample size, say setting it to 10 to take into account more seldom occurring aspects, however the result will be much less reliable. The last string says to us that Mercury's sextile to Saturn (Front aspect) looks like a significant one. We analyzed all these aspects during this 119-years period, and this aspect took place more than 100 times. 22 times this aspect (with orb=6 degrees) has coincided with reversal points. The control group show us that if this aspect would not have any impact on the stock market, it should coincide with the turning points only 13 times. In other words, when this aspect took place the stock market reversed his trend more often (22 times) than the control group shows (13 times). Remember that this aspect took place more than 100 times, and in 22 cases some turning point occurred. In other words, turning points took place in 22% of these aspects, while control groups shows 13% only. If this aspect would not work, it would coincide with the turning points only in 13% of cases. Chi square criterion show the degree of the difference between the real coincidence and the control group. 13 - the coincidence within the control group. The bigger chi square the more statistically significant event we have.